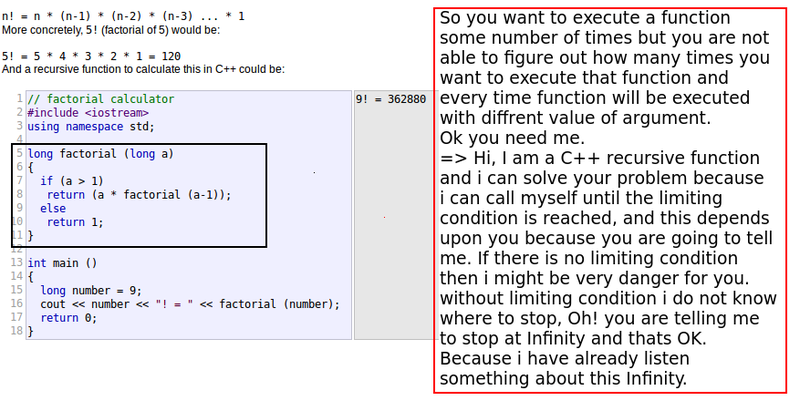 # A function, so i have a list of C++ statements and i want to give them a name and whenever i am going to call that name those statements should be executed. 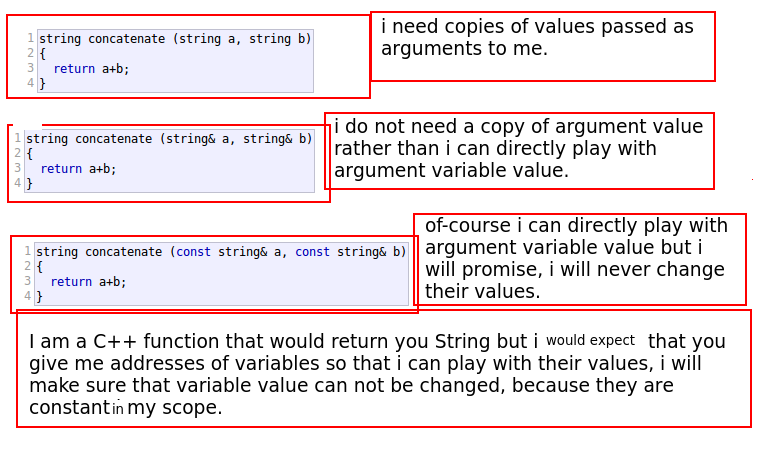 # This is why, functions are re-usable block of code that can optionally take arguments. ## Does function arguments necessary? # No? they are optional, but they make functions more dynamic and powerful. # Why we need Functions? # When you write code then you might feel that THIS block of code of these number of statements are being repeated. # So now you are thinking that, Is there any technique that can help you, Because you are lazy ( or smart ) and you do not want to write those statements again and again. # Ok, I am going to pack these number of statements and let me think about a name that can characterize its property, means what it does and when anybody can call them. 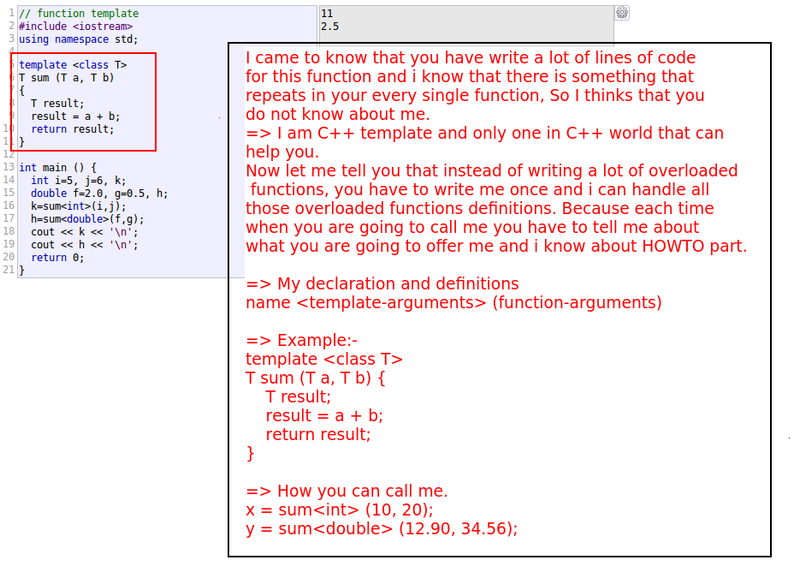 # Types of functions in C++? # Function that return nothing. 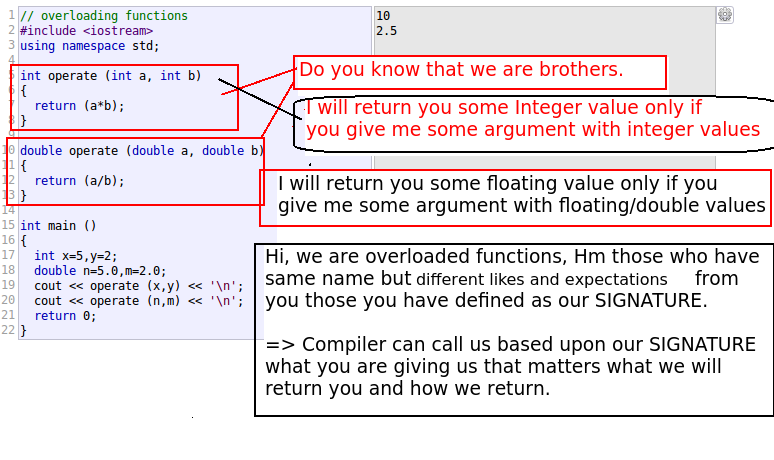 # Function that can return something. # Function that can return multiple values. # Function with some parameters. # Function with multiple parameters. 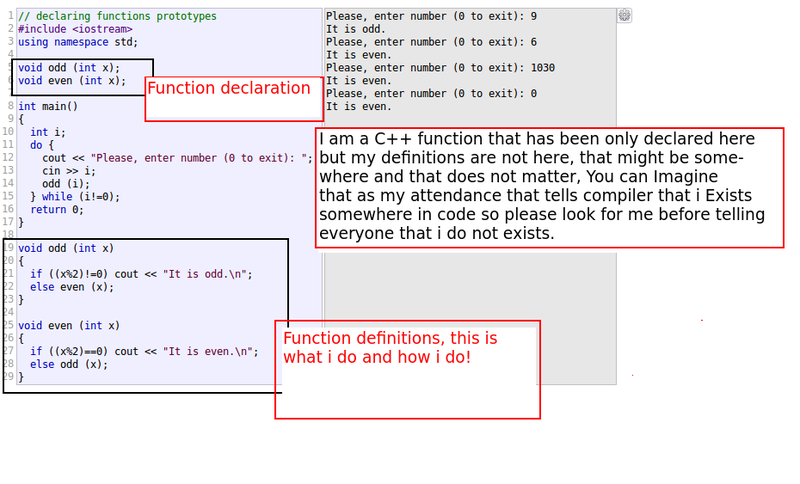 # Function with parameters and some/all of them have some default value. # Function that will promise you that you can trust them and give them references of parameters values, they will never try to change their contents. # What is a C++ Function Template? 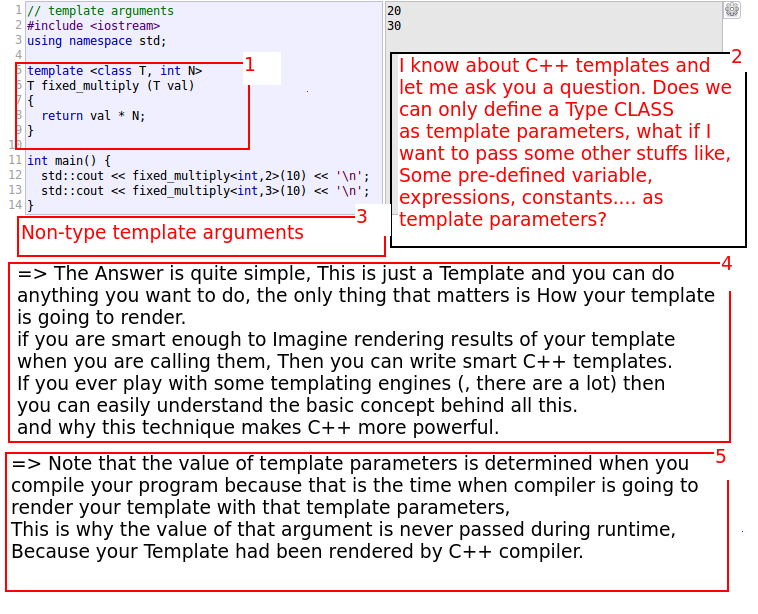 # A block of C++ Code that will be rendered at compile time with supplied template parameters. 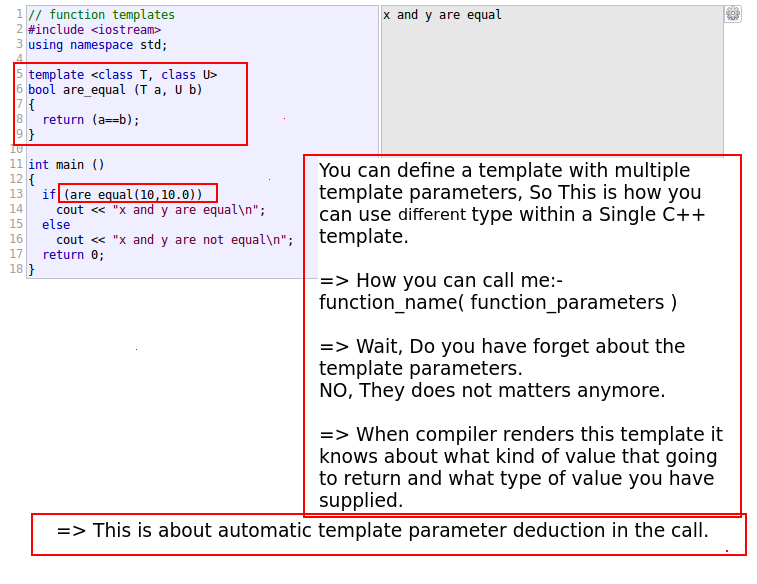 # Functions with generic types, known as function templates. # How C++ Function is different from C++ Function? # Function can return some value. # Template can not, this will be rendered with supplied template arguments.